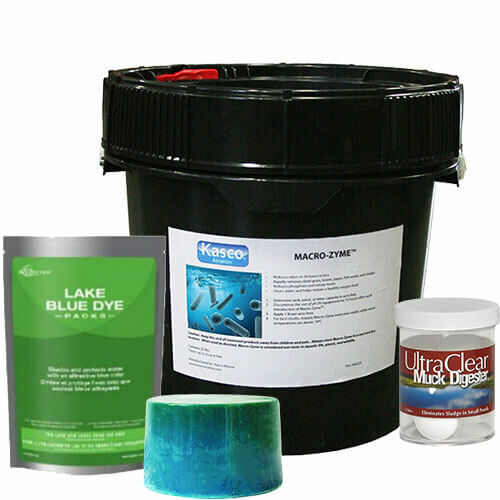 Lake Treatments Specifically designed for large ponds and lakes. These biological treatments create a healthy environment for your pond, breaks down organic sludge and slime, reduces ammonia and nitrite levels and more. Aquascape Wetland Pond and Lake is a highly concentrated bacteria containing 8 pure strains of beneficial bacteria, including PSB (Photo Synthetic Bacteria) bacteria and enzymes. This combination of natural cleaners helps to maintain a strong biological balance in your pond. Aquascape Wetland Pond and Lake maintains a strong biological balance; providing clean, clear and healthy water conditions. PSB help quickly clear pond water by clumping fine debris and allowing it to settle. Add to the area of the pond with the most circulation or dilute 1 or 2 pumps in a 5 gallon bucket of water and pour around the edge of the pond or in problem areas. Water temperature must be at least 50°F. One pump treats up to 4,000 gallons of water. After the pond has matured, use a maintenance dose of 1 pump per 4,000 gallons weekly. Specially formulated to keep farm retention and irrigation ponds clean and clear. compounds can lead to unwanted algae and weed growth. Microbe-Lift bacterial products are safe for people, livestock, fish, birds and all wildlife. Each kit contains 5 gallons of ML/Professional Blend Liquid (PBL) and 1 gallon of ML/High Count Spore Concentrate (HCSC). For lake and large pond use only!